Give me all the dainty jewelry, NO, give me all the g o l d dainty jewelry and bury me in it!! The more the better + my obsession is real right now + forever. Theres nothing prettier than layering it, stacking it and draping your body in it. Okay okay I'm going a little overboard but can you blame me!? If you're not on board yet, you need to be. Gold is in and it's not leaving any time soon. THANK GOD! Better than gold right now, is gold dripped in moissanite. I'm sure I'm not the first to tell you about the moissanite trend right now- the naturally occurring gemstone that is recreated in a lab. It’s not a diamond wannabe, it just happens to be a white stone like a diamond... so don't worry, we all still love our diamonds babes! These man made beauties, however, are saving our environment and land because they don't have to be mined like other naturally occurring gemstones! They're created in a lab making them an environmentally responsible and ethically sourced gemstone. YES PLEASE. What better way to protect our world!? Mining gems displaces a tremendous amount of land and wastes/contaminates billions of gallons of water a year. Charles & Colvard have been making these gems for 23 years and through their unique process, their Moissanite shines brighter than all others. The Iconery is on a mission to create unique, ethical jewelry thats within reach! Not to mention, with the help of Charles & Colvard's moissanite, they've created the jewelry of my d r e a m s ! Gorgeous stacked rings in 14k white, yellow and rose gold are flooding my dream space right now. (and every wishlist from Christmas to Birthdays to Anniversaries, sorry not sorry!) I got a tri color gold dainty stack and I'm never taking it off. I sleep, eat, live, bathe in my jewelry so real gold is a must for me! 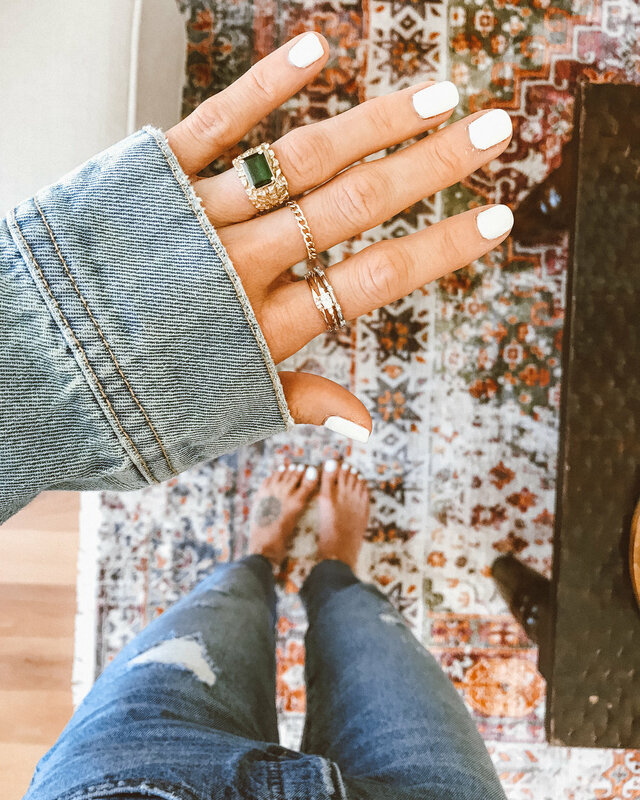 I never take my jewelry off for one- I'd lose it + for two- who has time for that!? These pretty little babies are here to stay and the perfect addition to my gold ring obsession. If they're on yours too, we can be BFF's forever because you just gettttttt me! I've already sent Austin over every other ring I want, my size + color of choice so that way the next time I say "I want nothing" he knows juuuuustttt what I really want. Charles + Colvard for The Iconery, duh!